On Tuesday, the Cleveland Indians are set to host the Chicago Cubs in game six of the 2016 Major League Baseball World Series. In the 68 years since the last title for the Cleveland Indians, and the 108 years since the last World Series title for the Chicago Cubs, energy production and consumption patterns in the United States have changed a great deal. In 1908, the last time the Cubs won the World Series, the United States produced less than half a million barrels per day (b/d) of oil, with crude oil production having only started approximately 50 years earlier. At that time, crude oil was mainly refined to produce kerosene for use in lamps. The first Ford Model T automobile was produced in 1908, kicking off a shift in demand for petroleum products from kerosene for lamps to gasoline for automobiles. The last time the Chicago Cubs made a World Series appearance, in 1945, the United States was producing 4.6 million b/d of crude oil. Production had been steadily increasing in the decades prior, as the economy grew and industry expanded following the Great Depression. The last time the Cleveland Indians won the World Series, in 1948, the United States produced 5.5 million b/d of crude oil. 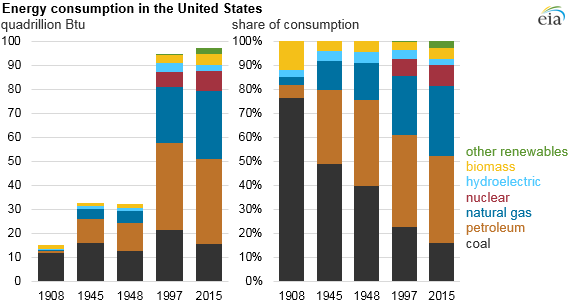 Crude oil production had been steadily increasing since declines in the 1930s and would continue to increase until production declines in the 1970s. More recently, in 1997, the last time the Cleveland Indians appeared in the World Series, the United States produced 6.4 million b/d of oil, falling to the production levels of the 1950s.